Ready for more bonuses? 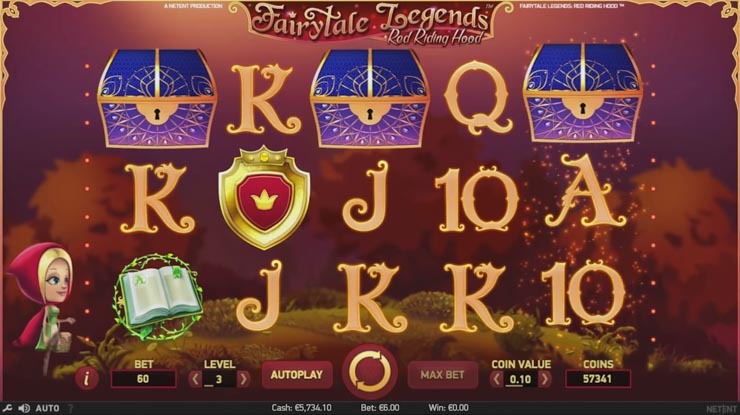 NetEnt presents a brand new Fairytale Legends series of slots, with the first 20-line release called Red Riding Hood. Just like they’ve done with the Theme Park and Rock slots, this tale inspired game has over 7 types of features, which can credit you up to 200x the total bet. Released on 24th October, the game’s already available for play at recommended NetEnt casinos like Casumo, Rizk and Ikibu. It’s also shortlisted for EGR’s prestigious Game of the Year 2017 award, highlighting its success for the past year. Here’s the Red Riding Hood slot bonuses from A to Z. Other than the fact that the game looks and plays on par with NetEnt’s premium slots, it has no less than 3 random bonuses for you in the base game too. All you have to do is just play and look out for the magical fairy for one of the three features: Fairy Magic Spins, Fairy Wild Spins, or the Fairy Surprise. Here’s what they’re all about at a closer look. If you’re lucky enough to win this, then as the reels spin the fairy will randomly pick several icon spots on any of the 5 reels. She’ll then wave her wand and transform them into one type of symbol, which guarantees a win of some sort. Could it be Wild too? No, but here’s something else with the substitution symbol instead. Just like the feature above, the Fairy Wild Spins is all about symbol overlays. But this time it’s not the high paying symbols but Wilds, so we could expect more wins as a result as well. And the maximum amount that you can win 3 to 4 Wild symbols. But the 3rd random feature is probably the best of them all. Fairy Surprise Bonus transforms multiple symbols into one type. The two features above were just a warm-up, because here’s a good surprise for you. If the Fairy Surprise Bonus kicks in, then she’ll pick a random number of symbols on the screen and transform them into one type of random symbol. As you can see from the screenshot, this can and hopefully will result in some pretty impressive wins. Now to the big guns. This one is pretty straight-forward like the rest. You need 3 of the Fairytale Legends Scatters on reels 1, 3 and 5 to trigger a feature selection pre-round. 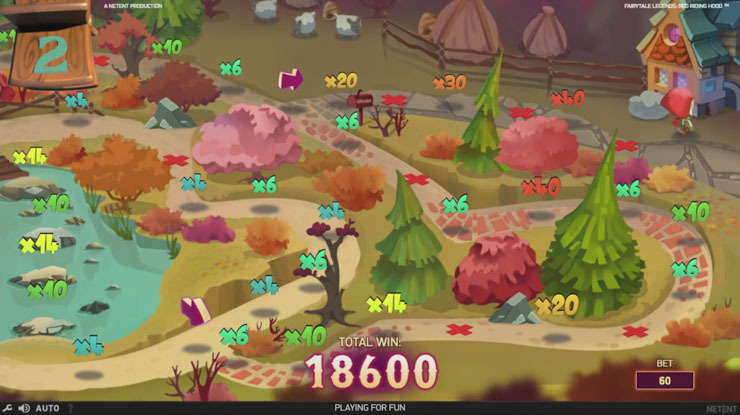 Trigger 3 Scatters to win the win coins, free spins or Beware the Wolf bonus. Pick a chest to reveal your prize: an instant coin reward, Beware the Wolf Bonus or Free Spins. As we know what the coin win means, here’s the 2 other features at a glance. Having a second-screen bonus of this level always adds a completely new dimension, especially to a mobile slot. If you’re lucky enough to uncover a chest with the Beware the Wolf bonus, then here’s what you need to know. Beware the Wolf Bonus with multipliers. It’s a board game type of feature, where you “roll the dice” by spinning a special spinner at the top left. As you help Red Riding Hood walk through the deep dark forest, you win various prizes, most of which are win multipliers. If you land on the right spot (“Double”), can also double all bonus multipliers in a moment. Avoid stepping on the Red Cross, which ends the feature. The good news is that there aren’t that many of them in the beginning. Finally, if you’re successful then you’ll reach grandma’s cottage and win the jackpot of 200x the total bet. Simple enough, huh? Free Spins bonus where each Scatter awards +2 spins. You’ll get 10 Free Spins to start with, and an opportunity to earn 2 more for each Scatter that you land during the bonus round. Brilliant! But there’s even more, because just like in the main game, the Free Spins bonus is also played with the Sticky Wild Re-spins feature. Each time you land at least 1 Wild symbol anywhere on the screen, you’ll get a free re-spin. Then for each one or more Wilds you’ll get another one. This will happen till there’s no more new Wilds. By the way, if you’re into re-spin features then NetEnt’s When Pigs Fly! has one with an expanding reel-set, check out the full review. 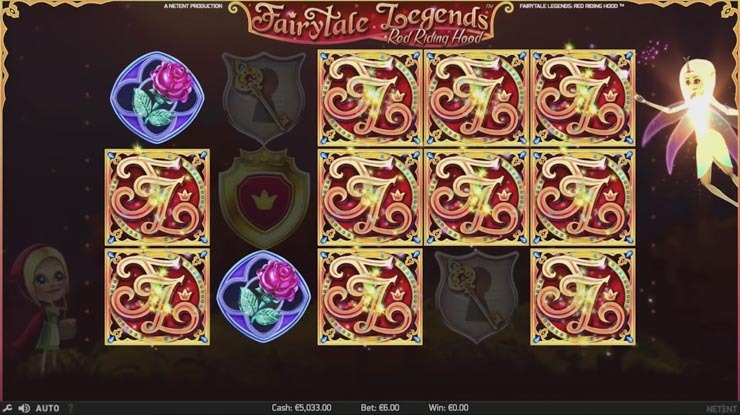 Last but not least, low and medium symbols in the Fairytale Legends: Red Riding Hood slot appear stacked, so there’s more chances to win in a single spin. Unfortunately, this doesn’t apply to Wilds. Click to play the Red Riding Hood slot for free at Casumo. Having launched a new mobile live casino product in September – NetEnt Live Mobile – it’s time for more magic for months to come with the 20-line Fairytale Legends: Red Riding Hood. 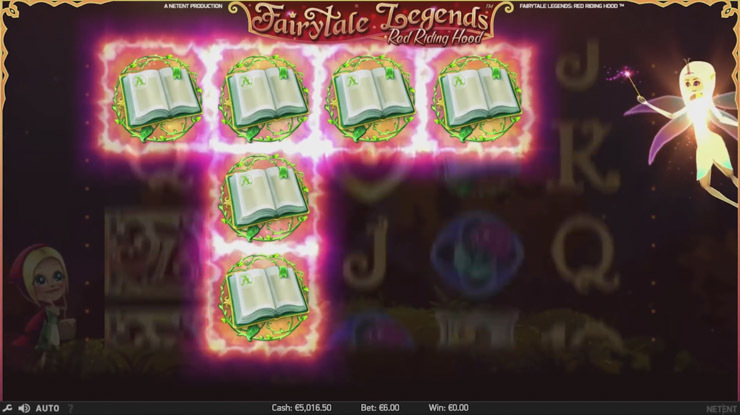 Fairy Magic Spin Bonus – random bonus with a symbol cluster. 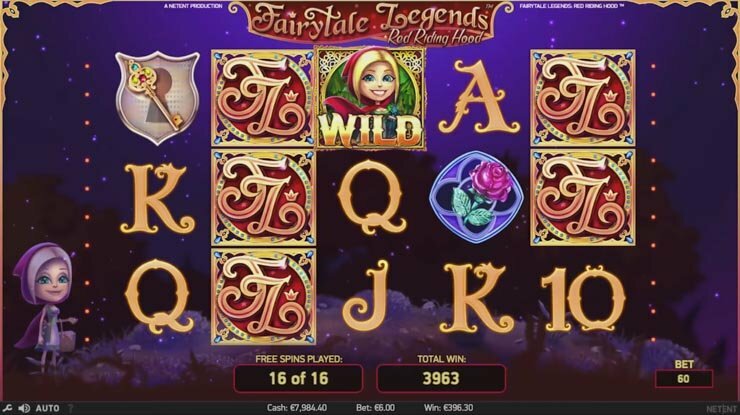 Fairy Wild Spin Bonus – random slot feature where Fairy awards random Wilds. Fairy Wild Spin Bonus – randomly triggered bonus where Fairy transforms multiple symbols into one type of symbol. Bonus Chest pre-round feature – pick 1 of 3 chests to win coins or 2 additional features. Beware the Wolf Bonus – board game, where you can win up to 200x the total bet. 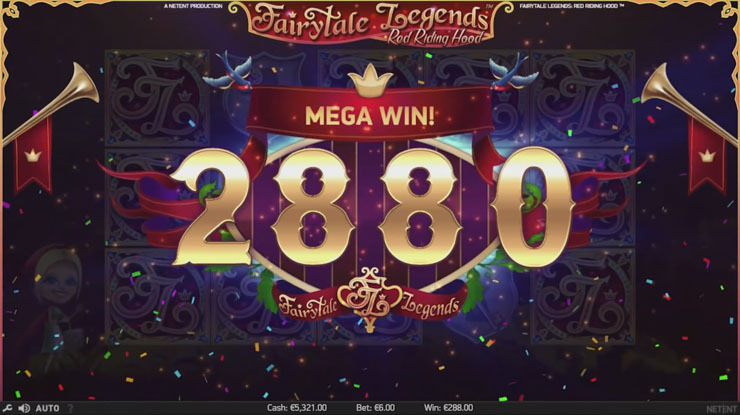 Fairytale Legends Free Spins – win 2 extra spins for each Scatter. Sticky Wild Re-spins – every Wild sticks and awards a free re-spin. Stacked regular symbols – win more frequently thanks to stacked low and medium symbols. Play Fairytale Legends: Red Riding Hood slot for free or real money at Casumo, Rizk or Ikibu. N.B. Other than the mobile Dead or Alive, there are two more slots released by NetEnt at the end of 2016, and one of them is Warlords: Crystals of Power. See how its 3 rulers can generate wins of up to 1,000,000 coins.